Model #: APC4012NC Click to view the whole line. The Any Power Combi inverter model is the first transformer based 4Kw inverter with 12V input. It’s a combination of power inverter, 115A battery charger and power transfer switch with a peak efficiency of 88%. This Any Power Combi series 4KW inverter charger with pure sine wave output is a combination of 12 volt power inverter, 115 amp battery charger and AC auto-transfer switch with a peak efficiency of 88%. The AC hard wire terminal block will output a continuous power of 4000 watts at 120 volts AC, and also a 300 percent surge capacity of 12,000 watt for up to 20 seconds. This 12KW surges runs many inductive tools and appliances easier with high startup surges, like electric chainsaws, portable grinders, refrigerators, freezers, microwaves and blow dryers. 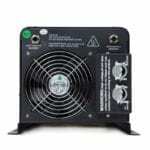 If you’re looking for a 4KW inverter with similar features but at 120/240Vac split phase , check out the 4000 Watt 12 Volt Pure Sine Inverter Charger 120/240Vac Split Phase. 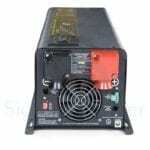 We also carry a unique 4000 watt inverter charger with 110V / 120V input and 220V / 240V output . The 4KW inverter charger accepts 12 volts DC input, which is great for vehicle upfitting, semi, RV and boat applications with a 12 volt battery system. During big storms that destroy utility electricity, the inverter power to operate a heater could save you a fortune by keeping plumbing pipes from freezing; a reliable power inverter running a sump pump could save your house from being flooded. The automatic transfer switch on this any power combi inverter is great for emergency backup power applications, the switch keeps the power supply uninterrupted in the event of power outages. When the 4000 watt inverter charger is connected to shore power, once the loss of input AC electricity is detected, it will start pulling energy from battery bank within 10 miliseconds to keep the power supply constant. With auto generator start, the inverter 4000 w is also able to command the backup generator to start when the battery voltage goes low. This inverter 4000 w also has an optional LCD remote port, allowing you to turn the product on and off and monitor the operational status from a distance.